1. Hair Treatment: I’m definitely not the first to think this one up – olive oil has been helping hair look shiny and lustrous since ancient Egypt. If you want to use the same hair routine as Cleopatra, it’s simple: warm up two tablespoons of olive oil in the microwave. When it’s warm (but not burning hot! ), apply it to your hair from your tips to your scalp. Wrap it up in a towel and let it sit for at least a half hour. Shampoo as usual and enjoy your healthier locks. 2. Makeup Remover: Olive oil is an effective, gentle choice for removing oil-based makeups. I especially love it for use around the eyes – it’s much gentler than many conventional makeup removers. You don’t have to get very fancy with it either. Just dip a cotton ball into a little bit of oil and use it to wipe your makeup away. After a quick rinse you’ll be done! 3. Moisturizer: Moisturizing your skin with olive oil is as simple as massaging a small amount onto dry areas. It’s especially effective at relieving dry, cracked heels. Before bed, apply a small amount to your feet after exfoliating, then slip on a pair of cotton socks. If you’re feeling a little more indulgent, pour yourself a warm bath and add 6 tablespoons of olive oil to the water. You’ll come out with skin that’s softer, smoother, and well moisturized. 4. Shaving Lotion: We’ve all run out of shaving lotion in the middle of the shower. Next time it happens to you, use a bit of olive oil instead. It will moisturize as you shave, plus it helps to reduce bumps and razor burn. 5. Nail and Cuticle Health: Nails love olive oil, and so do cuticles. Help heal dry, damaged nails and cuticles by giving them a warm olive oil bath. Heat up a few tablespoons of oil to room temperature, then soak your nails for about fifteen minutes. Gently massage excess oils into your cuticles, then wipe clean. The oil will work its way into your nails, providing moisture and nutrients that encourage healthy growth and reduce breakage and hangnails. 6. Prevent Wrinkles: Olive oil is a great source of antioxidants and vitamin E, both of which are vital for helping your skin stay young. Apply a small amount directly to your face 2-3 times a week to keep your skin soft and smooth and delay the signs of aging. Olive oil can have amazing benefits for your body, but do keep in mind that you can overuse it, especially if you tend to have oily skin. If you’re not sure how olive oil will impact your complexion, try using it on a small area to see how your skin reacts before using more. I also recommend using a high quality olive oil – organic extra virgin olive oil is my favorite. 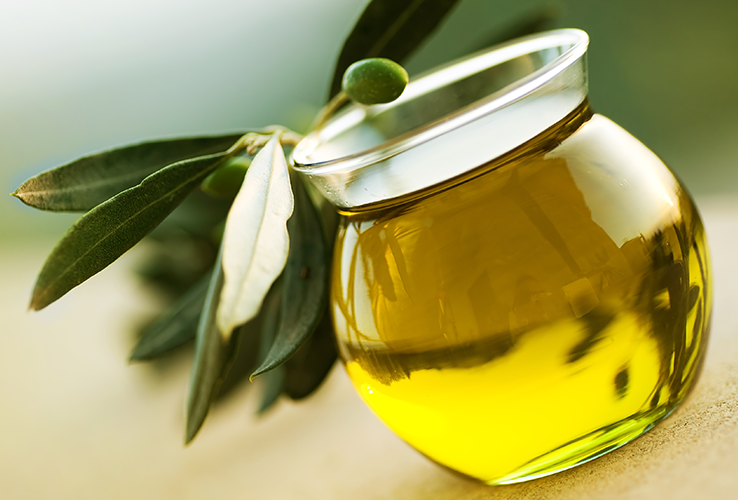 Have you used olive oil for skin health? What are your favorite techniques? Let me know in the comments below!